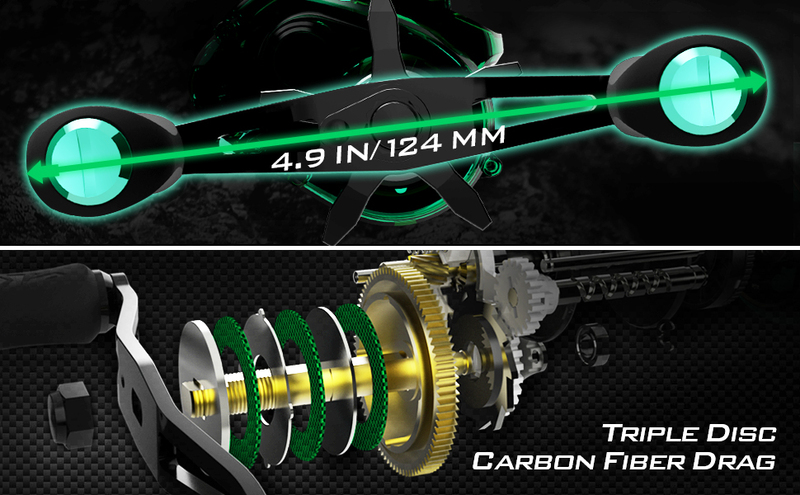 BUILT TOUGH – a KastKing Spartacus Maximus low profile casting reel has an all-aluminum alloy zero-flex body and frame, and an amazing 25 Lbs/ 11.33 kg of carbon fiber drag! It’s just what you need in a baitcast reel for saltwater fishing or large, hard fighting freshwater species. Maximus fights stronger; lasts longer. SMOOTH OPERATOR 10 + 1 superior quality shielded stainless steel ball bearings and one-way instant stop anti-reverse for solid hooksets. 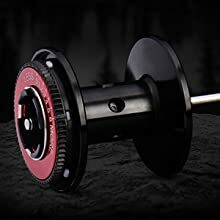 CNC machined aero-grade aluminum spool for long casts; anti-corrosion stainless steel main shaft and components and precision cut hardened brass gears for durability in the harshest fishing conditions. 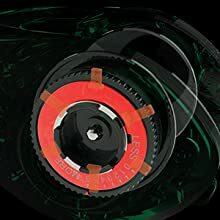 VERSATILITY – Maximus is an all-around 6.3:1 gear ratio baitcast reel that is great for many fishing techniques, with high performance dual brakes -- 6 level adjustment centrifugal brake and 10 level adjustment magnetic brakes, for casting control to prevent backlash. Large flat paddle EVA knobs for a non-slip grip. LOOKS MATTER – The new KastKing Spartacus Maximus low profile level wind reels are a notable upgrade from the original KastKing Maximus fishing reel. In addition to dual brakes, the new Maximus metal body baitcasting reel now features a fresh new color scheme that makes a great looking saltwater or freshwater baitcasting combo. GO FURTHER – KastKing Spartacus Maximus baitcaster reels have more line capacity for greater casting distance and to reach deep water bottom feeding species. 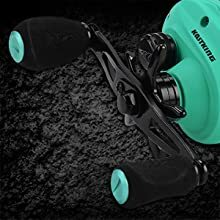 Maximus is a perfect heavy duty all-around low profile baitcasting reel that could be used as a trolling reel or an alternative for a conventional reel for bass fishing, kayak fishing, ice fishing, fishing with large swim baits or as a catfish reel. KastKing Spartacus Maximus cast reel is a great value among high quality aluminum baitcasters. It is the best bang for the fishing reel buck. Maximus baitcasting reels have lightweight yet zero-flex frame and body made entirely from non-corroding aluminum alloy, plus an aircraft grade aluminum spool and stainless steel main shaft and components make it a tough saltwater fishing reel. Among great saltwater fishing reels it is a beauty and a beast! You will love the extra stopping power of the Spartacus Maximus baitcaster with its incredible 25 lbs / 11.33 kg of super smooth carbon fiber drag. KastKing Maximus baitcasters have an advanced easy to adjust professional level centrifugal brake, which virtually eliminates back lash. It is accessible through a quick-open side plate. 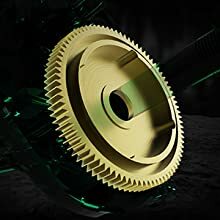 Maximus precision aligned brass gears with a 6.3:1 ratio and superior 10 + 1 shielded stainless steel ball bearings for more torque and smooth, quiet operation. Great reel! But won’t fit on some rods.. I recently bought this reel and I love it! It looks, feels, and performs amazing. I bought it for larger/heavier baits. My only problem was the reel would not connect to my G-Loomis EX6 7’6 Heavy power rod. The the piece the sits down and connects to the rod is to large. Not a big deal to me because I could swap to another heavy power pole but to new anglers this might be a problem if their rod arsenal is not very big... other than that, great reel and worth the money! Word of Caution- before using reel even pratice casting- Be sure to set internal centrifugal brake- it is preset at 0, from factory, i did not know this and after having spool filled with 80 yards of power pro braid, i casted it once and created the biggest bird nest ever- i had to basically remove 60 yards of line to fix all the knots. However after changing internal setting to 3-4 and magnectic brake to 9- it casts very smooth, effortless, without any backlash at all. Fits well in my hand and is the smoothest reel i have used in a long time. Very excited to get this reel on the water! Well made, buttery smooth and the color is definitely unique. I’m pairing it with a heavy rod for flipping and hoping the beefy build will be a good combo for the A rig too. Love KastKing products!! Kastking Spartacus Maximus, Very trustworthy Baitcaster.